A little more than a year ago, Kitsap County Commissioner Steve Bauer and Jon Rose of Olympic Property Group unveiled a plan to preserve 7,000 acres of forestland in North Kitsap. A tradeoff being considered was a possible new community in Port Gamble to absorb the deferred development. Lowland forests, like those in North Kitsap, are relatively scarce in the Puget Sound region, experts tell me. Preserving such lands are considered important for protecting fish and wildlife habitat, water quality and aquifer recharge areas. Furthermore, the North Kitsap Trails Association has already begun to plan for low-key trails throughout the area. While retaining the goal of protecting forests, Bauer announced yesterday that they would not pursue a new community created under a special provision of the state’s Growth Management Act called “fully contained communities.” The switch was described in today’s story in the Kitsap Sun. FCCs have fallen out of favor since the first ones were developed in King County. Many planners concluded that these early projects were little more than sprawling development well outside of urban areas. 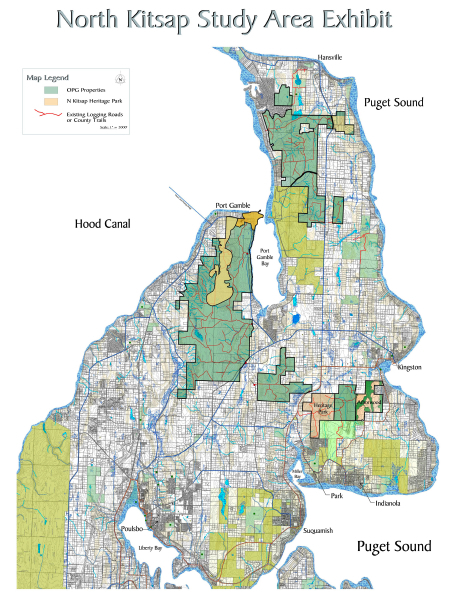 The Puget Sound Regional Council even developed a policy that discouraged local governments from proposing FCCs. Kitsap Couny planners argued that they would be able to avoid the previous problems with FCCs by requiring jobs and urban amenities to be integrated into the plans. Still, some people were never convinced. Members of the Port Gamble S’Klallam Tribe and environmental groups were worried that such a community would destroy the environment around Port Gamble. Now, Bauer hopes everyone can get on board with a plan to acquire as much forestland as possible, using grants, donations and other funding sources. 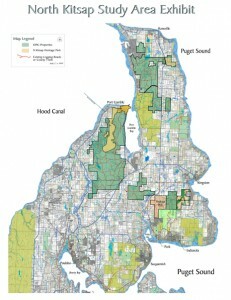 It’s not clear whether all 7,000 acres would qualify for outright purchase under the best conditions, but Cascade Land Conservancy has signed on to match wetlands, shorelines, critical habitats and recreation areas with associated grants from government and private foundations. Some growth is still planned at Port Gamble, which is designated a “national historic town.” As such, it will be allowed to increase in population to its greatest historical levels, with or without protections for the forestland.